Welcome to New Zealand, we have beautiful tree covered mountains, lovely beaches and rivers that look alright if you don't look too closely. I am your tour guide on this bus and I will hopefully provide you with some useful information and advice if you are a first time visitor to Aotearoa. Our conservation parks are well worth a visit, but please check with Department of Conservation staff to make sure you avoid the parts where there is mineral exploration or the recovery of windfall trees. If you stick to the tourist tracks you should be all right. We have some wonderful cities, but please don't try to do what you would in your home countries as we are the land of cars. I wouldn't advise trying to cycle as you would in Europe, or use our public transport, we have very few safe bike lanes and our public transport is often unreliable. If you look to the right you will see what was once the habitat of the Maui's dolphin, the smallest in the world. They only became extinct last year and when we stop the bus you will be able to see pictures of them. On the horizon you will see a number of drilling rigs. I should also warn you not to walk on the beach when we stop as one of the rigs had a minor spill last year and there is still a lot of oil in the sand and the dead birds washed up on it look a little unsightly and don't smell very nice. You will note as we drive through this farmland that there are lots of cows. Our diary industry is our largest export earner and we now have almost 7 million cows. Our Government has put a huge investment into irrigation and expanding the industry so we will see many on our travels. In answer to an earlier question, the lack of trees on our farms is because they get in the way of the farm irrigators. We no longer offer fishing trips here because fish numbers have dropped considerably over recent years. At one destination there is an aquarium where you can see some of the few remaining native fish. 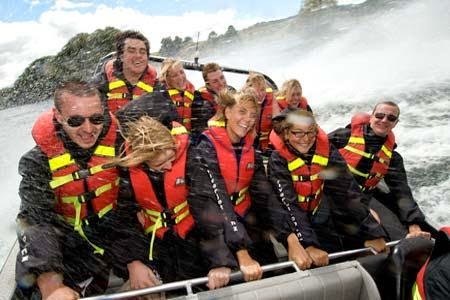 This afternoon you will have the opportunity to travel up a river on a jet boat. If you decide to do this trip I advise you to keep your mouth closed when there is a lot of spray and make sure you wash your hands afterwards because the water can be toxic if ingested. It is important that unless you are told otherwise, please stay in the boat! The Green Party announced one of our major priorities for this election, we want rivers clean enough to swim in. I'm sure tourists would appreciate this too. Missed the 1080 bombing on the national parks walking tracks. Although the 1080 drop should have a positive end result.